The Dialog Photos can be found here: Scenario/Global/Config. 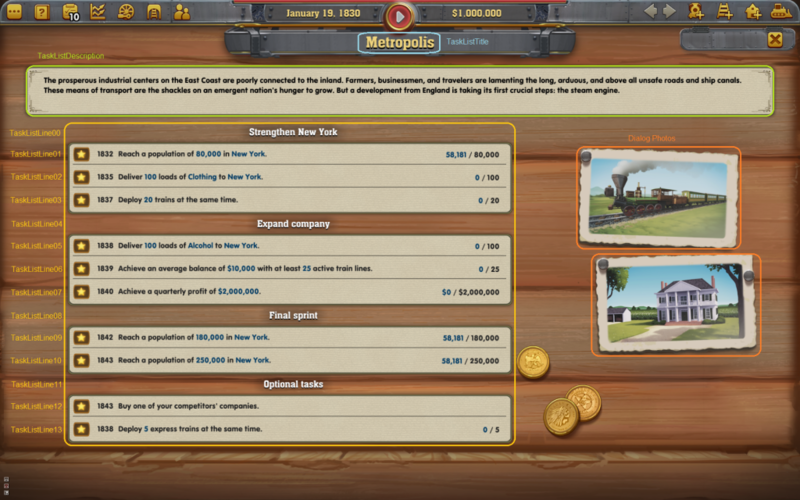 You can only select pre-existing images of Railway Empire and sadly, importing your own images is not possible. A list of all available images can be found here: Archive (RailwayEmpire_Tasklist). 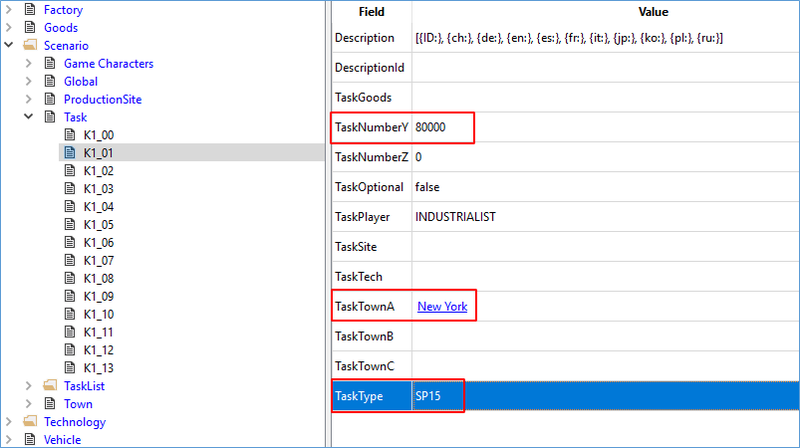 Any other data about the task list is located at Scenario/Task or Scenario/TaskList. 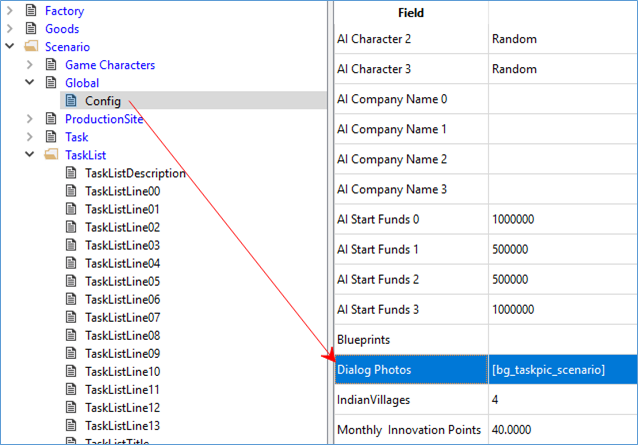 In order to change the title or the description of the task list or the chapter, you have to select TaskListDescription and TaskListTitle respectively under Scenario/TaskList and double click the Description field of each entry. A table will open up showing you the language Key on the left side and a Value for your custom input (e.g. with en for English or de for German and so on) on the right side. Caution: The ID of the DescriptionId has to be deleted in order to make the game using your custom input. This is true for all strings you might want to change within Tome. If you want to create your own task list, we would recommend to use a list that is already existing and simply adjust that list. Each TaskListLine of a task list can be assigned to a Task (TaskListEntryTask). The assigned Task will show up in the corresponding line (TaskListLine) of the task dialogue. A TaskListLine which has no assigned tasks will be taken as empty and will not be displayed in-game. In addition, each TasklistLine has a value called TaskListEntryYear where you can set a certain year as a condition for fulfilling the task. 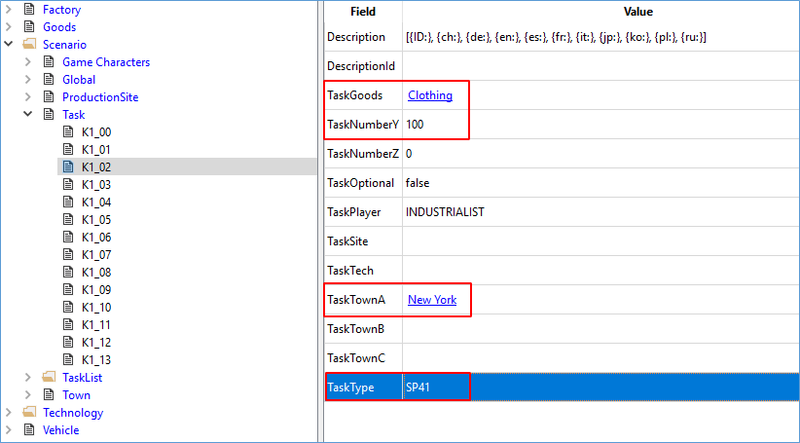 You can find a Task (in this example K1_00 – K1_13) under Scenario/Task and it has different values which have to be filled out depending on the TaskType. The TaskType value called TEXT allows you to use your custom inputs from the Description. As already told, the Description field is a table which needs the text in the correct language (Key). Caution: You have to delete the Id from the DescriptionId, because otherwise your custom input will not appear in-game. This is true for all strings you may want to change within Tome. If everything is done correctly, your custom input should now appear in-game as the sub-headline or title in the tasks dialogue. The TaskOptional field defines if a task is a main task or a side task. Main tasks have to be fulfilled, because otherwise the player will fail the scenario. Other fields of a Task are parameters of that particular Task depending on the TaskType. 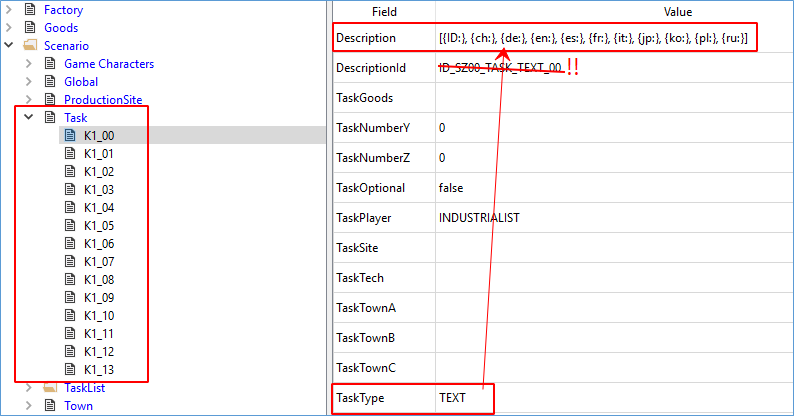 In order to make them work, each TaskType needs different parameters. 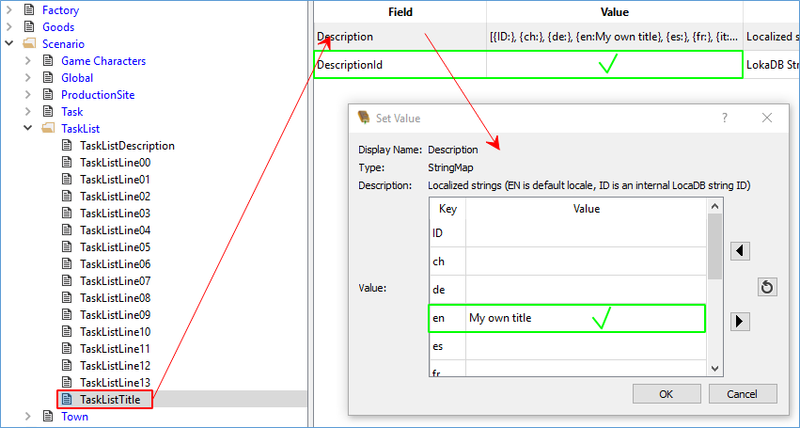 For any parameters you might not need don’t have to delete the Value necessarily, but it might help for a good overview. At the moment there are 45 different types of tasks. The complete list and all corresponding valies for those tasks can be found in the Archive (RailwayEmpire_Tasklist). Sadly, it is not possible to create new types of taks, but we will provide a whole lot of different tasks to you.